The File Transfer Protocol is a system for transferring files between two computers over the Internet. One of the computers is known as server and the other one is the client. The FTP program is very useful for website management as the webmaster can update the web pages by uploading the local files to the web server at a fast speed. For normal PC users, the FTP program can also be used to download files from many FTP sites that offer a lot of useful stuffs such as free software, free games, product information, applications, tools, utilities, drivers, fixes and more. The FTP program usually comprises an interface that shows the directories of the local computer and the the directories of the remote server. Files can be transferred just by clicking the relevant arrows. To log into the FTP site, we need to enter the user name and the password; however, for public domains, we just need to type the word anonymous as the user name and leave out the password. The FTP host name takes the form ftp.servername.com, for example, the Microsoft FTP site's host name is ftp.microsoft.com while the Netscape FTP site is ftp.netscape.com. The FTP program usually provides a set of commands such as ChgDir (changing directory), MkDir (Changing directory), Rename (renaming a file), view (to view a file), delete (to delete a file) and etc. 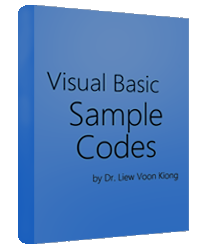 Visual Basic allows you to build a fully functionally FTP program which may be just as good as the commercial FTP programs. The engine behind it is the Microsoft Internet Transfer Control 6.0 in which you need to insert your form before you can create the FTP program. The name of the Microsoft Internet Transfer Control 6.0.is Inet and if you only insert one control, its name will be Inet1. After the user entered the above information, the program will attempt to connect to the server using the following command, where Execute is the method and DIRis the FTP command that will read the list of files from the specified directory of the remote computer and you need to use the getChunk method to actually retrieve the directory’s information. The above statements will ensure that the remote file will be downloaded to the location specified by the localpath and the file downloaded will assume the same name as the remote file. For example, the remote file is readme.txt and the localpath is C:\temp , so the downloaded file will be saved in C:\temp\readme.txt.